Mouth ulcers are also known as canker sores and aphthous somatitis. They are inflamed sores and painful forms of ulcer that occur in the mouth. If the mouth ulcers last more than 3 weeks, then need to take proper medication from the doctor. Homeopathic medicines are very helpful and effective in the treatment of mouth ulcers. The exact cause of the mouth ulcers is very important when it comes to the selection of remedies. There are various homeopathic remedies for mouth ulcer. Let’s just have look at a few remedies in details. Borax is quite helpful when your mouth ulcers turn sensitive and hot. You may experience the sores breaking out in the inner area of your cheeks, on your tongue, and on your gums. Even though you may produce profuse saliva, you may experience dryness within your mouth. If you suffer from tender and hot mouth, motion sickness, sensitivity to the noise, and bleeding mouth ulcers on touching them, then you need Borax for treating the condition and obtaining a relief. 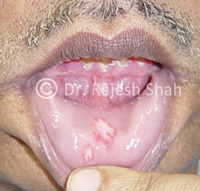 Mercurius Solubilis is an effective homeopathic remedy for mouth ulcers. When your gums bleed, you develop an offensive breath, and your tongue gets coated and swollen, then Mercurius Solubilis is highly recommended for alleviating the condition. Your mouth sores may turn worse at night, and you might experience profuse salivation and drooling when asleep. You may also become quite sensitive to the change in the temperature and sweat at night. In such circumstances, Mercurius Solubilis may help mitigate the discomfort and provide you a relief. Nitric acid is a highly effective homeopathic remedy in alleviating the discomfort resulting due to the mouth ulcers. It helps in healing your body and reduces splinter-like pain that you experience due to the mouth ulcers. Nitric acid is extremely effective in curing all types of mouth ulcers, such as canker sores and other kinds of ulcers. It is the most beneficial homeopathic remedy for the ulcers that are very sensitive to touch, bleed easily, and have irregular zig-zag shape. If you suffer from painful, burning mouth sores and feel tired and exhausted, then Arsenicum album may help you a lot to alleviate the discomfort. When you have burning and dry mouth and when your ulcers soothe by using warm water, Arsenicum album is recommended for obtaining a good relief. By having hot drinks, your pain may decrease. You may feel the best relief by maintaining the warmth. Arsenicum album helps in soothing your easily bleeding, unhealthy gums significantly. Mouth ulcers can be treated effectively with the homeopathy along with the correction of nutritional efficiency. Homeopathy is also quite helpful in regulating your stress level so strongly as suggested and necessary in the treatment of mouth ulcer. So, if you anytime suffer from mouth ulcers, make sure you choose homeopathic treatment for quick and effective relief without any concerns.